Imgur has introduced a new feature in its Android and iOS app using which you can send reaction GIFs from Imgur directly in Facebook Messenger. This really spice up things; you can post funny, interesting GIFs in chats. A GIF can sum up all the reaction and feeling during an online chat. The process is really simple. All you need is the Imgur app, and the Facebook Messenger app. Just launch Facebook messenger app and tap the ‘More’ icon from the middle right corner of the chat screen. 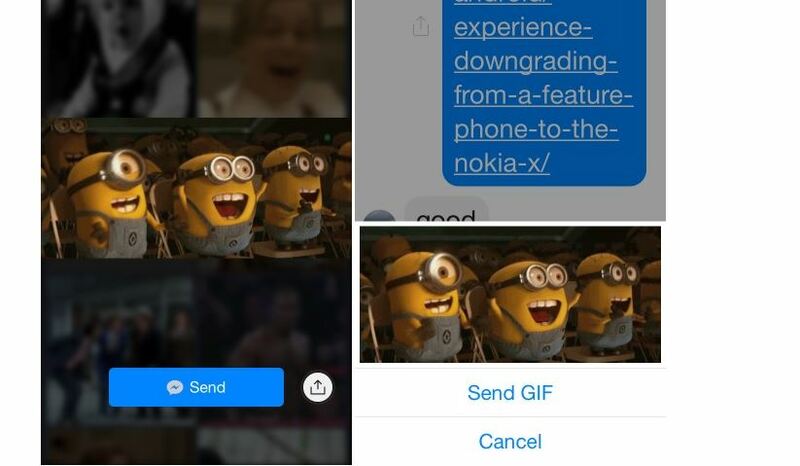 You will see a list of apps which allows sending GIFs in Facebook Messenger. Imgur is now in this list. Tap Imgur, and you will see different categories like “Happy”, “Angry”, Nope”. You can tap any category, see and choose thousands of GIFs. You can also put a keyword in the search bar above to search the GIFs. For example, you can put “WTF” in the search bar to get interesting and funny GIFs depicting hilarious surprise reactions. You can also shake your device to get a random GIF. Once the GIF is selected, just tap “Send” and it will be sent. The recipient of this GIF could see this image even without the Imgur app.